From the outside, the building looks like a round giant alien spaceship that just landed on earth, with a blue roof topped by a white cross. The inside combines the best of both traditional and contemporary church design. There, one finds a chancel surrounded by pews on a semi-sloped floor. The chancel area seemed a bit crowded, though, with an altar, a huge wooden pulpit, a baptismal font, and a communion table with bread and cup on display. But the most prominent feature is the ceiling, where there is a giant cross made of two huge beams that support the circular structure. 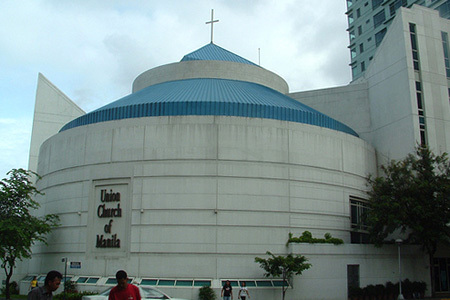 The Union Church of Manila was founded in 1914 by a group of Presbyterian, Methodist and Disciples of Christ missionaries who agreed that a united ministry to the American population in the country transcended denominational concerns (the Philippines was a still a commonwealth of the United States at the time). The church struggled to survive during World War I, the Great Depression, World War II and the war for the liberation of Manila. After the United States recognized Filipino independence in 1946, membership grew quickly and the church became a major presence in the religious fabric of the Philippines, carrying on dozens of ministries and outreaches. 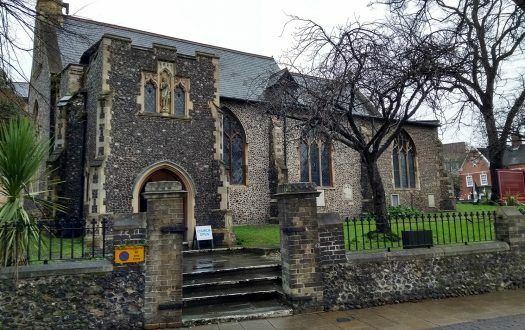 It still advertises itself as an "international evangelical, English-speaking church," and at the service I attended the congregation were certainly not your everyday folks – they were diplomats, educators, executives, and other such high profile people. The church is actually not in Manila! Its present building is in Makati, a suburb that became an independent city in 1995. Dismissed as "worthless swamp land" by the island's Spanish explorers in 1571, Makati today is the financial and commercial center of the Philippines. A highly cosmopolitan city, Makati features many cultural attractions and entertainment venues as well as upscale shopping malls. The Revd Steve Ruetschle, senior pastor (a Presbyterian from Washington State, USA); Pastor Marvin Layug, praise and worship director; and others. Contemporary Service (8.45am) and Traditional Service (10.30am) – I attended both! When I arrived for the early service, there were about 100 people present, but by the time of the sermon, there were perhaps 500! The later service was bulging at the seams – perhaps 1000, including those in the overflow rooms. A gentleman shook my hand and said, "Kindly turn off your cell phone, sir. Thank you!" After that, a lady handed me a bulletin and another lady directed me to the fourth row of the center section, saying, "It's the best section in the sanctuary." The pews were nice! No pads, no kneelers. Just plain wood. Quite comfortable. At the contemporary service, the worship team were rehearsing a bit while people huddled into small chat groups. Then, about 10 minutes before the start of the service, someone began to play the mighty pipe organ and it didn't seem like a contemporary service anymore! At the traditional service, the chancel choir did a sound check while people entered quickly. The sanctuary was almost full by the time the organ prelude began. (8.30) "Good Morning! Let us stand and worship God together." (10.30) Nothing was spoken; we began with the opening hymn. The Holy Bible, New International Version and The Hymnal of the Presbyterian Church were in the pews, but we used neither. All we needed to sing, read and see were flashed onto two screens at either side of the chancel. At the contemporary service: Piano, synthesizer, electric guitar, bass, violins, drums and percussion. Oh yes, the organ too for a brief moment. At the traditional service: Pipe organ and piano. Several things distracted me at both services. The projectors were too low-powered for such a big church with huge untinted windows! I had trouble reading the words. And there are just too many beautiful women my age in that church! Both a distraction and a blessing! I couldn't keep my eyes off a particularly attractive woman who sat across the aisle from me. At the later service, a gentleman sitting next to me fell asleep and began to snore. The contemporary service was replete with lots of happy clappy singing, but it was all quite dignified. And the selections were "older contemporary" – I'd even call them retro. The style was evangelical, and yet included more traditional elements as well. It was the only contemporary service I have ever been to where the Gloria, Apostles' Creed and Lord's Prayer were recited. By contrast, the traditional service was stiffly liturgical, with choir and organ. 30 minutes. The pastor delivered the same sermon at each service. 7 – The pastor is a young man – probably in his mid 30s – but is a gifted preacher. His style was highly evangelical, but I could wish that it were not quite so conversational. He took as his text John 14:4-14. Jesus is the only way, the only truth, the only life. Starbucks owes its success to the fact that it sells more than just coffee – it sells company. People are very lonely and hungry for companionship! People are desperate to be known and needed. Christianity is about knowing a person and joining a family! Christianity is about connecting! At 8.30: The "retro" worship music! At 10.30: The choir singing and the organ playing! And in both: People from every tongue, tribe and nation! That's like a taste of heaven on earth, really. The pastor asked the first time guests to stand. An usher then approached with a microphone and we were made to tell everybody our name and where we were from. Many would regard this as hellish – actually, I thought it was fun and not at all embarrassing! 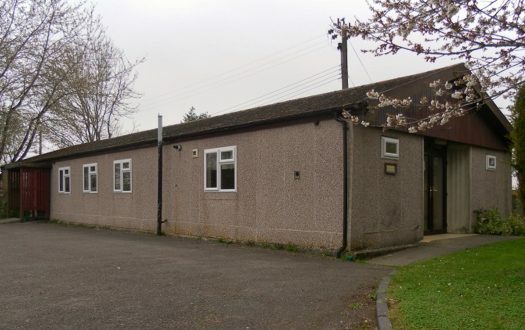 I went down to the fellowship hall in the first basement (there are five basements!) and took some coffee and a cookie. I finished both without anyone coming up to talk to me! I left the building having met and known no one. And I thought Christianity was about knowing a person, joining a family, and connecting. Coffee was hot but bland! Cookie looked cheap. Tea and juice were also available, but I didn't sample them. 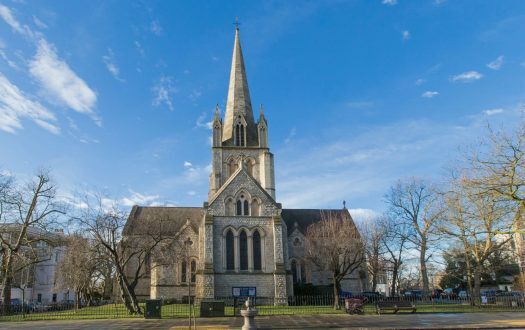 5 – It seemed a nice enough church in which to belong, but people could make use of a little more friendliness. Yes. I'll always be glad to be a Christian regardless of how a worship service goes! Flashback of the face of the beautiful young lady seated across the aisle from me.